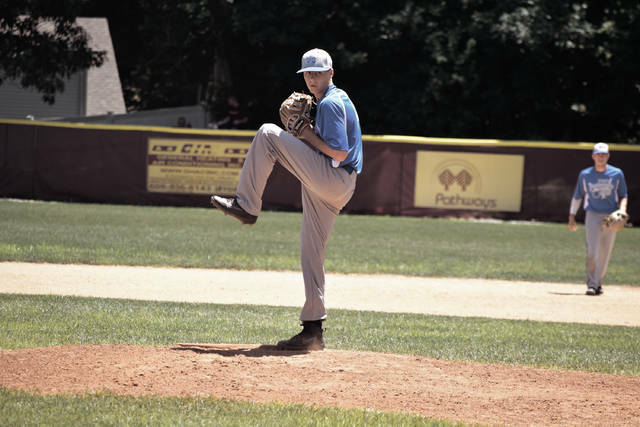 Reid Shultz threw a complete game two-hitter and struck out four in Post 23’s 14-2 win over Russell Post 325 in five innings. Post 23’s Tanner Kimbler comes across the plate to score one of Portsmouth’s 14 runs. 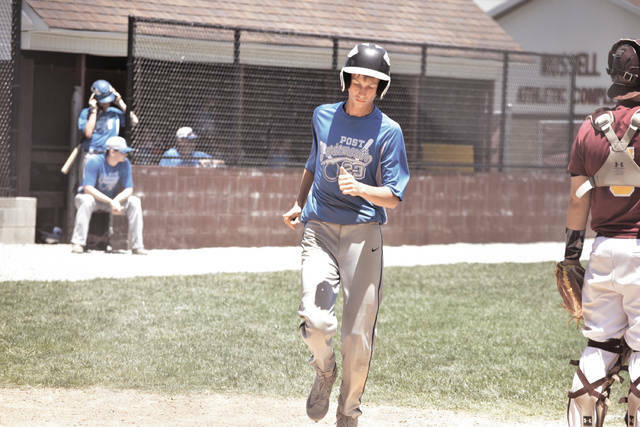 RUSSELL, Ky. — On Thursday, the Post 23 bats were nothing less than scorching in a promising display that saw the Senior Legion boys pound out a total of 17 hits in two victories against the Diamond Prospects 15U and the Huntington Hounds 16U squads. That total, however, paled in comparison to what Portsmouth did early on Friday afternoon. In just five innings of play against Russell (Ky.) Post 325, Post 23 nearly equaled its impressive output from both games combined on Day One as Matt Miller’s club scored 14 runs on 13 hits in a 14-2 throttling of the homestanding Red Devils on Friday during the second day of pool play as part of the Gene Bennett Baseball Classic. For Miller, the contest was simply a fun game to watch — especially considering that eight players combined to obtain the 13 hits while also only committing a single error in the field of play from a defensive standpoint during a complete game effort from Reid Shultz. After Tanner Kimbler reached on an error to start the contest, the leadoff hitter stole second base and advanced to third base on a single from Brayden Davis. A walk from Cole Dyer then loaded the bags for Kyle Gammon, who produced yet another sacrifice fly to score Kimbler and put Post 23 on the board first, 1-0, after an inning of play. And while the damage was of an innocent variety to start, it would only begin a much more fruitful outing for Portsmouth as the game continued on. In the bottom of the second frame, back-to-back walks by Will Darling and Seth Nichols were followed by a one-out single to left field by Jarrett Stamper to load the bases for Kimbler, the leadoff hitter. A .550-plus hitter for Green in 2018, Kimbler wasted no time taking advantage of the golden opportunity to produce by launching his own single to left to score Darling and Nichols. The heat, however, was just beginning. With only one down in the inning, Davis cranked his own single out to right center field to score courtesy runner Jake Ashkettle, and Cole Dyer immediately followed with a single down the right field line to score Kimbler. Gammon then continued his red-hot hitting exploits from the cleanup position by rounding out the second inning scoring with a double down the left field line to score Davis as Post 23 ultimately obtained a 6-0 advantage after two innings of work behind the five-run second inning outburst. And it was the efforts of Kimbler and Davis, who reached base in each of their seven plate appearances in the opening contest on Friday while scoring four times altogether, that got the ball rolling. That crooked frame, however, paled in comparison to what Post 23 put together in the fourth inning of action. There, Kimbler and Davis notched back-to-back singles, and back-to-back errors allowed both players to come across. Stolen bases by both Dyer and Gammon then followed, and Shultz followed with a two-RBI knock to left field to score the latter pair as Post 23 increased its lead to a 10-0 cushion. Singles by Darling and Nichols, along with a drawn walk by Tyler Speas, plated another run, and a 6-4 RBI groundout by Stamper, along with RBI shots by Davis and Dyer to the outfield, ultimately added three more tallies to the scoreboard as Portsmouth took a monstrous 14-0 lead after three-and-a-half innings of play. From there, Shultz, despite the long break in pitching with 13 guys ultimately batting in the fourth frame, remained poised. Minford’s masterful utility man proceeded to throw a complete game two-hitter while striking out four, and outside of giving up a solo home run to Russell’s Jacob Funk, didn’t allow another hit between the second through fifth innings as Post 23 closed the deal early.